LookStat, an analytics platform for photographers that sell their work online in micro-stock marketplaces, has closed a $500,000 Series A funding round led by Founders Co-op. Lookstat is a tool for photographers that allows them to track their earnings across online stock photography sites like iStockphoto, Shutterstock, and Dreamstime, with support for Fotolia, 123rf, and Stockxpert coming in the near future. The site can automatically identify when the same image is being sold at multiple sites, and can aggregate all sales for that image into one place. Lookstat is also currently tested a workflow platform designed to help photographs distribute their content. While the site is currently free, it will eventually begin to charge a subscription free, though it will likely remain free for any photographers who earn less than $100/month. While LookStat may be addressing a niche market, it’s one that is growing steadily. In February we saw Fotolia reach one million registered members, with 1.5 million paid downloads a month (Comscore currently reports that they have over 2.8 million unique visitors). 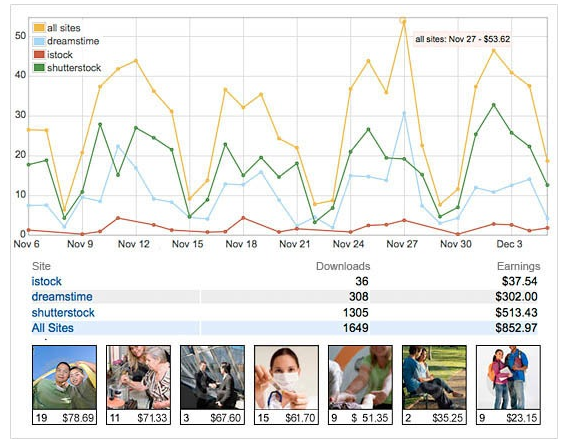 Competitor iStockphoto, which was purchased by Getty Images in 2006, gets over 4.8 million monthly visitors.